By bringing together two inner-city schools that have been recipients of the NHLPA's Goals & Dreams fund over the past few years, the National Hockey League Players' Association, along with a couple of its members, helped host the first ever ‘NHLPA Goals & Dreams Cup' this past Wednesday at Toronto's Ted Reeve Arena. 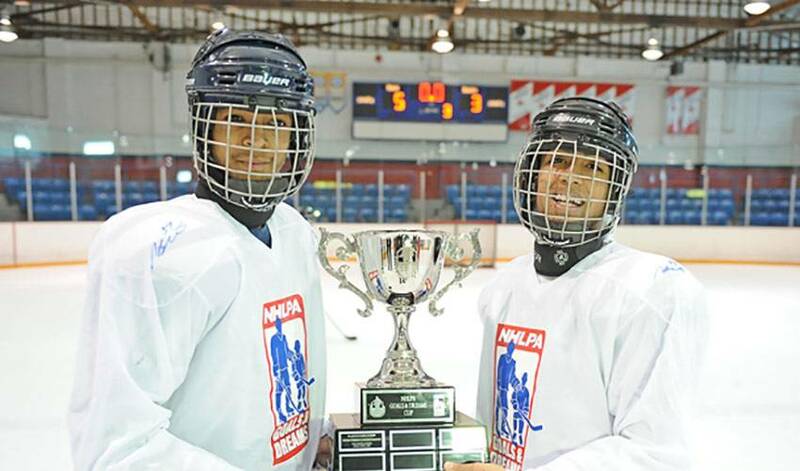 Sir Sanford Fleming Academy and Eastern Commerce Collegiate Institute were the schools that faced-off in the event, showcasing the hockey programs that have grown out of the donations received through the Goals & Dreams fund. The game, and with it, the ‘Goals & Dreams Cup', was ultimately won by Team White, who defeated Team Red by a score of 5-3. But the final score was far from the real story on Tuesday, as this was a special day for the kids far beyond the scoreboard. The two teams were comprised of children from each school mixing and playing together, and were coached by Toronto Maple Leafs players Luke Schenn and Tim Brent, who both signed autographs on the bench for their charges. Following the final buzzer, the players lined up to shake hands and take group pictures with their teams and coaches. A pizza lunch was then served, where all of the kids received plaques for playing and were able to have their picture taken with the Ted Lindsay Award, the NHLPA's player voted award for the Most Outstanding Player annually in the NHL. The day was well-received by all those who participated, from the organizers down to the players. Nolan's teams, who used to play with old leather skates and skateboard helmets, received equipment grants from the NHLPA's Goals and Dreams fund to help develop his programs and he has seen results in his players that he says renders him speechless. The Goals and Dreams Cup seemed to do the same to his players, by his account.